In this quick tutorial we look at standard musical contexts, where the Minor and Major Pentatonic Scales can be used effectively. 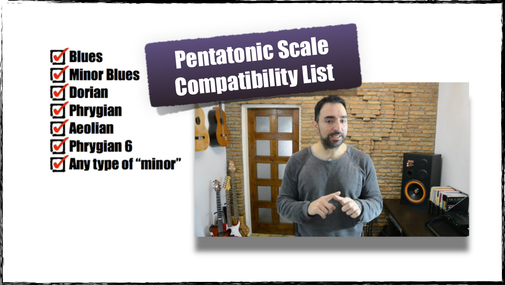 "Where to use Pentatonic Scales"
"Mixing Modes and Pentatonic Scales"
Download the Pentatonic Compatibility List PDF, and other freebies, by signing up for the EMP Mailing List. "Scale Choices for 12-bar Blues"
Improvisation Demo over random minor chords.